When you hear the words attention deficit hyperactivity disorder, or ADHD, people often think of the young boy who can't sit still in class. But what about the young girl with ADHD who isn't so disruptive and doesn't get diagnosed? Often, they work harder than others but never quite fit in. Kirstin Boncher, Evelyn Polk Green and Lisa Wright always felt that they were different. They lived much of their lives not understanding what is wrong with them. 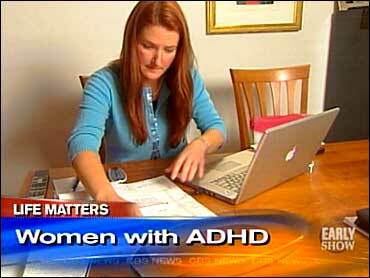 That is because all three suffer from a condition typically associated with children, ADHD. Green went to college on a scholarship. But once there, she couldn't keep up and she dropped out. "I can remember sitting in my apartment for days at a time in the dark, because once I fell behind, I didn't know how to catch back up," she told The Early Show correspondent Susan McGinnis. "I didn't know what to do to fix it." Boncher found daily life overwhelming. "It's every little task that you have to do in a day: making breakfast, making lunch, making dinner. And you see something else that you have to do so then you do that too," she said. "It gets done. But, it's — it's such agony." And with the agony, comes a feeling of failure. Wright couldn't seem to finish anything. "It's like I'd be 99 percent done and I can't get the last step," she said. "I wanted to live up to be what I thought I could be, or what other people are, you know." Dr. Mary Solano is a psychologist who specializes in ADHD. She says normal, everyday tasks such as paying bills, doing taxes and cleaning the house are extremely difficult for people with ADHD. "For people with ADHD, this might go so far as forgetting or not paying the bill, even though one has the money so often or for such a long time that the lights get turned off," she said. Dr. Solanto said people with ADHD have a problem in the brain's "executive center." "The normals have a lot more activation in this executive center, the ADHD people have virtually none. They activate a different area in a larger more diffuse way," She said. "All the evidence indicates it's genetic in origin." Green learned she had ADHD when her eldest son was diagnosed. It was as if the therapist was talking about her. "It was that light bulb," she said. "And it was a sense of relief, you know. I'm not lazy, crazy, stupid. There was a reason that all that stuff was going on." Yet being diagnosed with a disorder that many people think is over-diagnosed isn't easy. "It is painful when people say to you, 'Oh, you don't have anything wrong with you,' and they feel like they can judge something … they wouldn't judge whether I had a heart condition or not," Boncher said. "It's an invisible disorder." All three women got help from medication, which works by stimulating the area of the brain that isn't active. Doctors say this is the best form of treatment, but Wright struggled with the idea. "I went through a phase where I was very unhappy I have a problem that requires that I take medication for the rest of my life," Wright said. "And that — that wasn't a — a good phase at all. Wright compromised. She took medication to help her finish her work through the week, but not using it on the weekends. "I liked to be myself on the weekends," she said. "I'm creative. I'm fun. I'm outgoing. My impulsivity happens to be a thing that most people who I know like about me." Today, with the right diagnosis and treatment, all three women are doing well. Boucher can now enjoy her family more, Wright started her own business and Green is a school administrator in Chicago. "Most days I feel really good about myself," Green said. "Not every day, but most days I do feel good about myself. And those days when I don't, I always feel like there's hope."